Homes in a North Belfast housing estate that have been targeted in sectarian attacks will be more secure after the erection of a new gate, a local councillor has said. For up to ten years residents of Somerdale Park off the Crumlin Road have had their homes targeted by youths coming through an alleyway from the nearby loyalist Glencairn estate throwing paint bombs and stones and even petrol bombs. 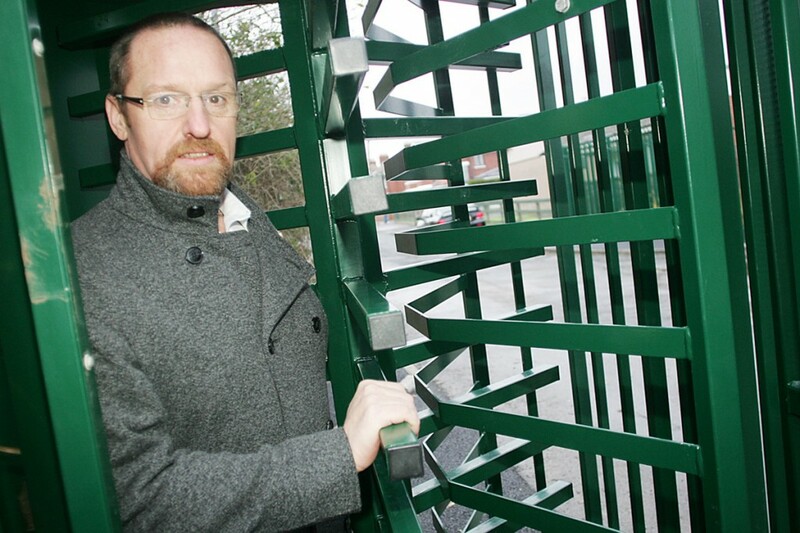 However after pressure from local residents and local Sinn Féin councillor Gerard McCabe the Department of Justice last week installed a new gate and turnstile designed to curb the access at night. Access to the alleyway, which serves as the rear entrance to Belfast City Council’s Clarendon Multi-Sports Facility, will be closed in the evenings. Cllr McCabe said he was hopeful that that will go someway to reducing the problems for the Somerdale residents. “Homes here have been targeted for some years and residents have been calling for something to be done as a matter of urgency,” he said.